Our Sticky Tac Mats are available in different sizes and quantities shown below. Feel free to call on 01372 747 555 if you are unsure which Tac Mats best suit your requirements - we are always happy to talk to our customers. Also referred to as tacky mats, our Sticky Tac Mats are sourced from within the EU and are of exceptional quality. We even supply these mats to Buckingham Palace among other prestigious establishments. Available in a range of sizes, these Tac mats are free-standing, durable and help keep your floor entrance space clean and safe. They have been designed to keep all dirt from shoes, push-cart wheels or other objects that pass over them. These sticky Tac mats have also been designed to meet the latest industry standards and pass the ISO quality standards so you can be sure these mats are safe for your environment. From the pharmaceutical, hospitality and food & drink industries to more specialist labs and building or construction industries, these sticky Tac mats can be found just about anywhere where a clean walkway area is needed. Browse through our current range of tacky mats below and place an order with us today for quick delivery. Alternatively, please call us on 01372 747 555 with any enquiries. Sticky Tack Mats come unframed with adhesive backed base will stick to most smooth surfaces. They perform well, long lasting and have a low profile construction. This is a sanitary product that guarantees hygienic and contamination-free surfaces. Used to maintain a maximum dirt-free environment, for hospitals, clinics, tattoo studios, engineering, manufacturing, clean rooms, construction sites and much more. Our Sticky Tac Mats are 99,9% effective when correctly used, applied and when layers are peeled of as they wear out. We have an ISO-certified five step dust and impurity elimination system implemented in all our mats. The efficiency was tested under a maximum of 150kg load. Not hazardous to health, nor contain health-hazardous materials. The Tak mats are suitable for use in intensive care units and ER rooms. 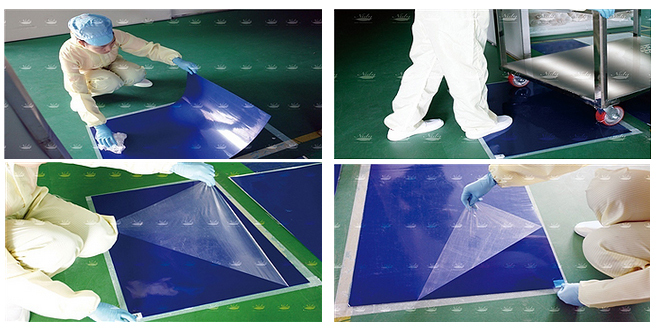 We have the highest industry standards in the process of sticky mat development, resulting in high level of stickiness and dust removal effectivity, while maintaining thin profile which prevents physical issues with installation, such as stumbling, or car/bed wheel obstruction. All our Sticky Tac Mats undergo rigorous ISO standardized anti-bacterial treatment to improve efficiency. This is especially important as they are commonly used in medical environments such as hospitals, ER units, laboratories, surgery rooms. Our Sticky Tac Mats pass the ISO quality standards, as certified by CSN EN ISO 9001:2009 norm, which is fully complementary with world-wide quality standards. Sticky Tac Mats are highly sought after by data centers and server rooms as well as semi-conductor production sites for their dust removal and dirt prevention qualities. For this purpose, we offer an optional anti-static ESD treatment for all colours and sizes of our sticky mats - please enquire if you are interested. The Sticky Tac Mat works by capturing, with adhesives, all dirt from shoe soles, push-cart wheels, etc . Size of Tak mat is 90cm x 60cm. Colour is blue. Blue is the industry standard for many laboratories, medical centers, clean rooms, data rooms and emergency departments and intensive care units. Other sizes are available, also special orders are available upon request – call our friendly sales team on 01372 747555! Price breaks are available – the more you buy, the cheaper they get!